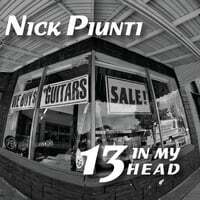 Nick Piunti-13 in My Head. If the name Nick Piunti isn't familiar to you then perhaps you know him from his time as frontman for Detroit's The Respectables, a band featured on these pages in years past. While I certainly enjoyed The Respectables, nothing prepared me for this solo turn by Piunti which I'm putting in pole position for top power pop album of 2013. 13 in My Head has everything you'd look for in a power pop album - crunchy guitars, great melodies and big hooks, and features assistance from the likes of Andy Reed and Ryan Allen. The title track opens things up nicely and really will make you feel 13 in your head again (especially if you were 13 during the 70s or 80s), followed by "On the Way Out" which is simply one of the catchier songs I've heard all year and reminiscent of Paul Westerberg in pure pop mode (a la "Dyslexic Heart"), complete with a "na-na-na-na" chorus. "Good Thing Going" keeps a good thing going, and "It All Comes Down" comes down squarely in Cheap Trick territory. The hits keep coming (if this were 1975) with "She's a Good Time" offering classic rock flourishes in service of another catchy tune, the bright rock of "Reasons" and the stacatto Beatlesque guitars of "Farewell Goodbye". Throughout, Piunti's slightly raspy, slightly snarling, vocals keep things from getting too saccharine (heck, there isn't even one outright ballad to be found here). 13 in My Head should be soundtrack for any power popper's summer this year. Anny Celsi-January. June might be a strange time to release an album titled January, but Anny Celsi is welcome any time of year on your music player of choice. Following up on 2010's Tangle-Free World, Celsi dials back the jangle a bit on a more introspective yet still melodic collection of songs with a wintertime theme. "Au Revior, My Darling" is a great pop tune to open the album, bouncing along with that famous Motown bassline and handclaps and harmonies, followed by the midtempo gem "Travelogue" which really evokes a lazy day traveling along. The winding melody of "Kaleidoscope Heart" brings Aimee Mann to mind, and the piano-and-guitar number "Sank Without a Bubble" ambles along quite nicely. Capping things off here is a lovely cover of Steve Forbert's "Wait", a favorite of mine since the original was released back in 1979, and which perfectly captures the wintertime feel of the album. Once again, Celsi is assisted by pros such as Rich McCulley and Nelson Bragg, and the result is a classy and enduring slice of laid-back pop. loved the previews for Nick; got it from bandcamp. will probably get Amy's in the near future- I have Tangle-Free World & it's great!